The Clear™ cartridge contains a half gram (500 mg) of lab-tested pure distillate. With bold brilliant flavors, these carts deliver the best vaping experience on the market. Try the unflavored “Lobster Butter”, or any of the other 16 original flavors that are all 100% contaminant and solvent free. Our Elite Collection features an ergonomic stainless-steel cartridge with ceramic coil, 510 threading, adjustable airflow, and THC potency between 85% and 92%. Our Classic Collection features the original plastic cartridge, 510 threading, and is slightly cut with MCT for a THC potency between 62% and 68%. This cartridge flows better in cold weather and is offered for a lower price. 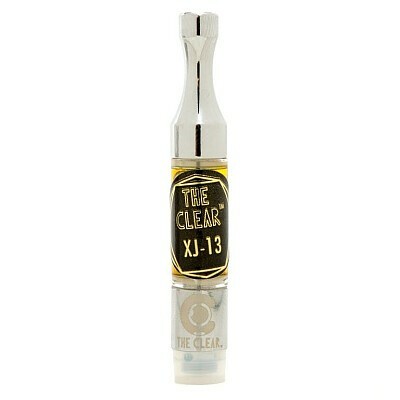 Distinct, classic, sweet and piney, our XJ-13 flavor is instantly recognizable to Jack Herer aficionados. The XJ is a cannabis-inspired flavor with a naturally sativa-heavy terpene profile.